I get asked all the time about meal timing, and supplements, and micronutrients and this and that latest antioxidant (or whatever craze there is currently) when people are struggling to lose weight or that last little bit of stubborn belly fat. They STRESS over those little details…little details that honestly don’t matter for 90% of us! And it made me think about creating my own pyramid for success when it comes to dialing in your nutrition. 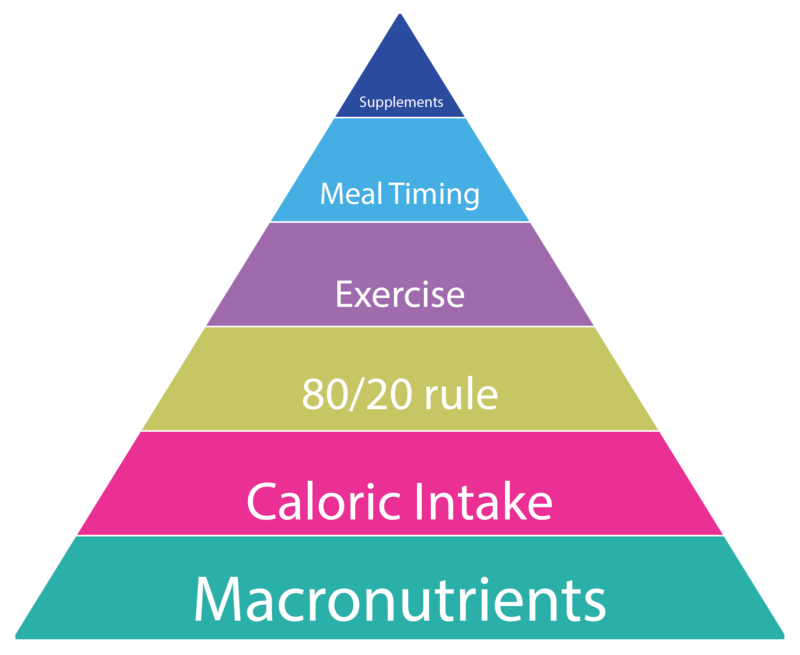 So here it is…my nutrition pyramid…And yes…yes it does include exercise. Because let’s face it…While nutrition is about the foods we eat so we can be healthy…most of the time we are looking to dial in our nutrition for weight loss or body composition changes, which are also dependent on dialing in our workouts. And I also wanted to emphasis that all that worrying we do about pre-workout nutrition or supplements or antioxidant pills or whatever else, really is the LAST thing we should be worrying about. The first thing you need to do is focus on your macros. Yup…even over the quality of your calories or your caloric intake. Because if you dial in your macros, guess what follows…EVERYTHING ELSE! If you focus on the breakdown of the foods you eat, and use my macro ratios, you can’t fit in a ton of crap AKA you basically are forced to dial in the quality of the foods you eat. 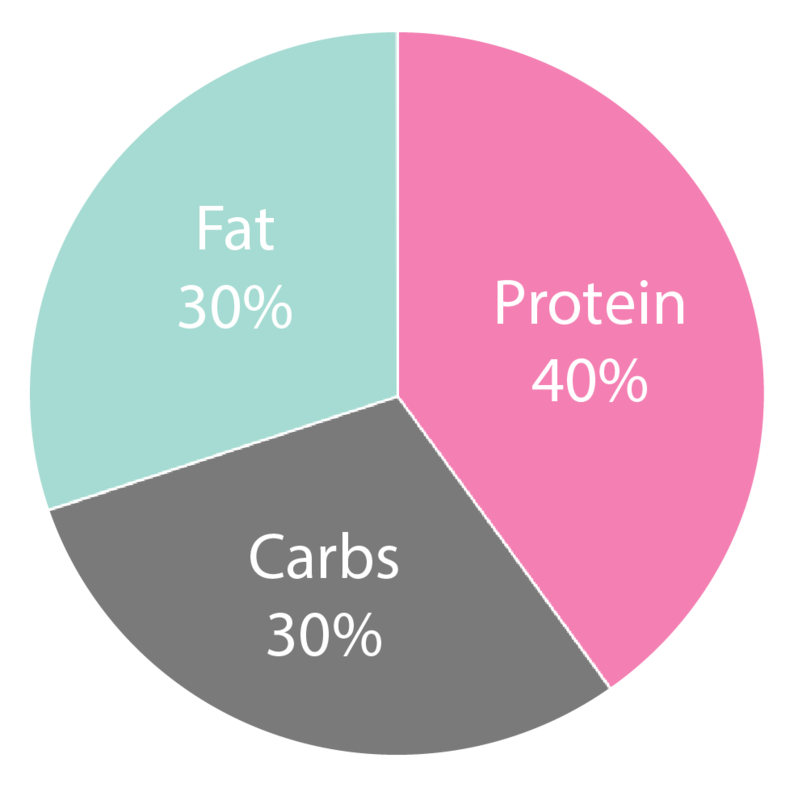 AND even if you technically eat over your caloric needs, the high protein can help prevents you from gaining fat. The thermogenic effect means you’ll burn more calories to process protein into energy, making it harder to gain weight on a high protein diet. Plus, protein keeps you feeling full so you are less likely to overeat. It’s because cutting your calories and eating whole, natural foods often isn’t enough to fully get the body composition changes we want. All too many people have come to me after slashing their calories super low, FRUSTRATED they are still stuck at a plateau….and now super hungry and low energy. Because we are told that weight loss is about eating less than you expend, right? Well YES…a caloric deficit is key, BUT m&m calories and chicken and rice and broccoli calories are very different. Have you ever gotten frustrated by your lack of results EVEN while eating only whole, natural foods? Yea? Well you aren’t alone! Some of the people that have come to me have too. Because it is more than the fact that M&M’s are processed crap (the peanut butter ones may be delicious but they are still processed crap)…they are also basically carbs and fat. That is why a calorie deficit alone may cause you to plateau and that’s why you may not get the results you want even while eating only whole, natural foods. So Macronutrients are the first thing to dial in. 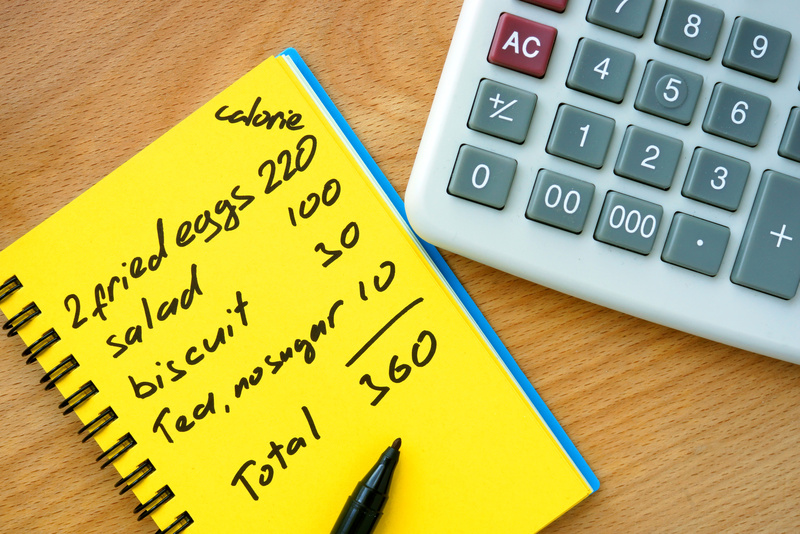 As you dial in your macros, you can then adjust your calorie intake. A. You realize you can consume WAY MORE than you are actually eating and by bumping your calories you get better results. B. You may think you need way more calories than you actually do to feel full BECAUSE focusing on protein keeps you feeling fuller for so much freaking longer! And it doesn’t have the energy spikes and lows of fueling yourself based on just carbs! So after macros, you need to focus on your caloric intake. THEN after that, focus on the QUALITY of your calories. Blah blah blah we all know whole natural foods are better for us. But I’ve been around the block a few times…And I’ve worked with tens of thousands of clients around the world, and I know the yo-yo dieting cycle all too well. We like…nah we LOVE…some of that processed crap. Let’s face it. There is a reason they make it that way. Cause it tastes F****** DELICIOUS. So if you’re one of those weirdos who doesn’t like anything processed, I salute you. Huge fist bump. 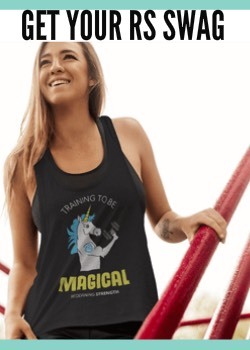 But anyway…When you dial in your macros, you help yourself eliminate enough crap to be healthy AND get results while still leaving in enough crap to make it SUSTAINABLE. NOPE! It almost makes you feel more like you are simply ADDING new things in. That shift in how you view your diet is key. And think about it…If you focus on whole, natural foods 80% of the time and 20% of the time you eat crap, you’re still consistently going to get results because you are consistently doing the RIGHT things. And you are going to ENJOY what you are doing which is going to help you build a lifestyle. If instead you tried to do 100% clean and then were constantly “falling off your diet,” which let’s face it means basically eating 100% crap, you probably won’t over time even come close to that 80/20 rule. So that is why after focusing on macros and your caloric intake, I say start to dial in the quality of your calories, remembering you can still keep in some “crap” and ENJOY what you are eating! Then after that comes exercise. And I think it is important to keep exercise on the pyramid, even though I’m talking about nutrition, because it matters more than timing or supplements. Far more. It is also important to keep exercise on this pyramid because all too often we let our “diets” hinder our progress in the gym. If you can’t push hard during your workouts because you aren’t fueled correctly, you aren’t going to continue to make gains or hit your fitness goals. If you have specific fitness goals, like setting a new race PR or deadlifting more or achieving that first full pull up, you need to focus on fueling your work toward those! So you need to remember that part of eating well, part of changing up your nutrition plan, should be about fueling your workouts. Being able to push hard in the gym will not only help you reach those fitness goals, but it will also be key to you getting better and faster weight loss and fat loss results. You need to be able to CHALLENGE yourself if you want to build muscle. 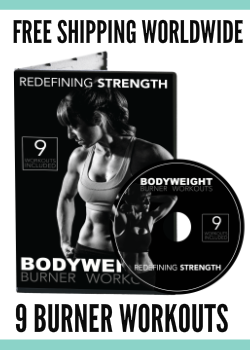 And you NEED to build muscle (and I don’t mean “bulking up” here ok?) 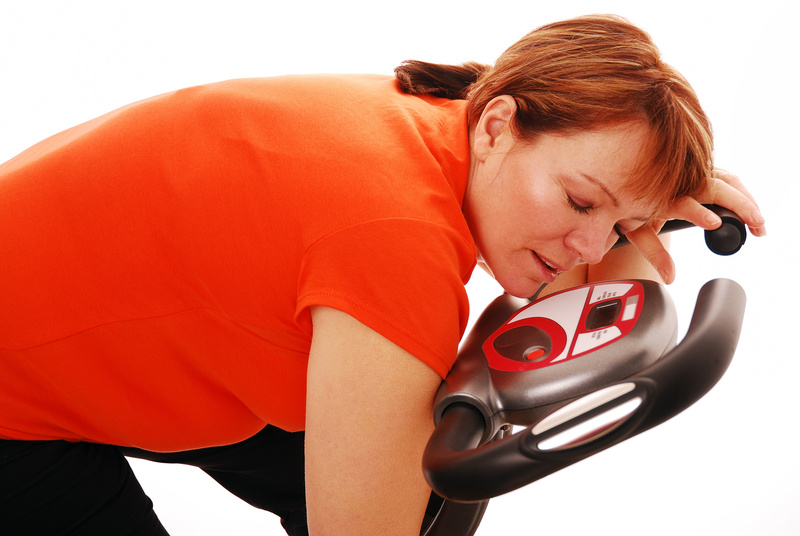 to burn more calories at rest so you can lose weight faster. 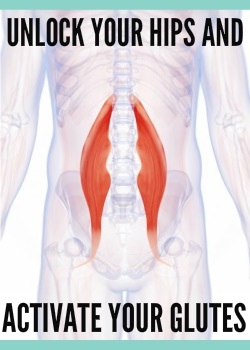 Plus, you NEED lean muscle mass IF you want to actually look leaner as you lose weight! So EXERCISE is an essential piece to consider when dialing in your diet. It not only speeds up your results, but the quality of your workouts is highly influenced by HOW you eat. 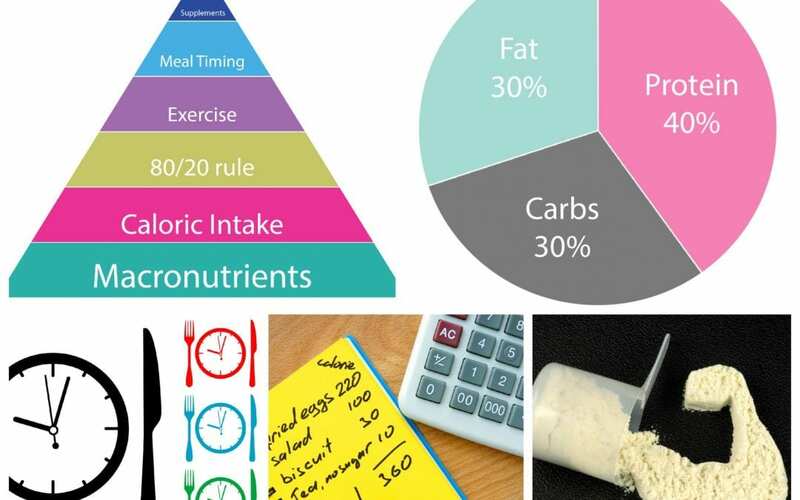 AND exercise is also on the pyramid because it play a part in figuring out how many calories you need daily! So do not ignore this important piece! And then at the top of the pyramid we have meal timing and supplements. Honestly all I’ll say about supplements is I use them to make things either A. taste good or B. make sure my macros stay in line. I don’t believe in fat burners or any of that other random fad jazz. Not saying it can’t work or that you should avoid it if you want to experiment with it, BUT the other parts of the pyramid matter WAY MORE and if those aren’t dialed in, no supplement or perfectly timed crap meal will fix it. Supplements should be just that…supplements to the well laid out plan we’re already sticking to. Those final tweaks we do that get us just those last few percents of improvement that we need. If you hit your macro ratios for the day, you’re going to get great results regardless of when you eat. Intermittent fasting can work. Eating 5 small meals a day can work. As long as you hit your macro ratios and caloric needs for the day, you WILL get results. 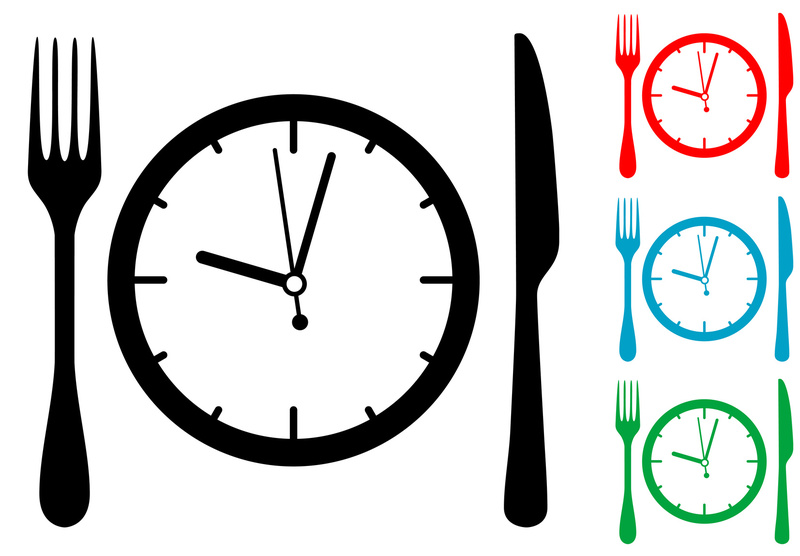 HOWEVER, meal timing can be something to consider to make sure you are constantly energized and fueled. For instance, using intermittent fasting to starve yourself, which will end up with you binging later, is NOT a good idea. So meal timing is important to consider in terms of YOUR specific needs. Do YOU feel better when you eat more often? Or do you prefer a 16 hour fast and skipping breakfast? BUT freaking out over eating every two hours, or exactly what your pre-workout and post-workout snack need to be, should be the last of your thoughts when starting a diet. It’s that stuff you micromanage and tweak when you’ve already laid a solid foundation. It’s not the stuff you worry about at the beginning and let stress you out so you don’t even get started. Don’t overcomplicate things! If you hit your macro ratios for the day and time your meals so they fit your schedule and keep you satisfied…You’re going to get kickass results. Start with your macros. Track what you’re doing. Dial those in. As you make those big changes, you can then slowly, over time, play around with stuff at the top of the pyramid. But don’t stress at the beginning over things that make very little difference, especially if the foundation of your diet isn’t already 100% dialed in! Ready to start building your foundation? Want to find out what macro ratios YOU should start with?